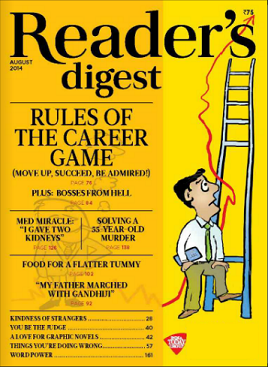 The October 2014 issue of Reader’s Digest India reached us quite before time 🙂 – precisely, on 30th September 2014 -, and here are our personal view and reviews for the same. The yellow and white background cover page is cool. 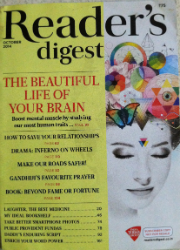 The other good thing we like about the cover page is, the beautiful life and brain are integrated in a fantastic way. The reader’s reactions about the issues, articles and stories published in the past issues are interesting read. As referred in one of the James Bond films, the next world ward could be for Water. An article about Aabid Surti and his team doing to save water is really fantastic. Personally we have read a lot of writings by Mr. Surti, we were not aware with his heroic side. We simply appreciate his entire team’s efforts for a cause. You can get more information about the mission he and his team is running at: http://ddfmumbai.com/. A similar article about a youth named Joesph (age: 15 years) who is inspired to do robotic innovation to help the soldiers who are back to their home, is worth reading. Such heroes inspire others to do efforts which make the world a better place. Joy of giving – is another such article, which tells us that no giving is small. Actually achieving even small things gives us joy, and giving such joy to others, gives us immense joy. You should read such nice real life incidents. My ideal bookshelf – gives you a list of some good books, but we expected more from this article. As 2nd October is celebrated as Gandhi Jayanti and hence you see a unique photo of Gandhiji and the entire “Vaishnav Jan To” (a song written by saint poet – Narsinh Mehta) – the favorite song of Late Gandhiji is available in this issue, along with English translation. We wish that the original Gujarati lyrics must have been fully visible. The articles about health and technology are good to read. One article about “homework hassles” is an interesting read. A lot of young generation parents will be able to link themselves with this article emotionally for sure. The themed article about the “brain” is interesting. A detailed article about Abu-Dhabi talks about the culture, modernization and much more. The travel junkies and culture scholars will like to read it. Even those who like to explore the knowledge about various parts of the world will enjoy it for sure. Inferno on wheels – is a thrilling real life drama where 3 women are stuck in a burning car on highway. How they are saved will really make you believe in destiny. Fairest of them all – is quite an emotional story to read. A night in the Amazon – is for adventure lovers. It is nicely written. The second part of the story of George Washington Carver will interest to those who read the first part or otherwise. Overall a balance issue which is worth going for.